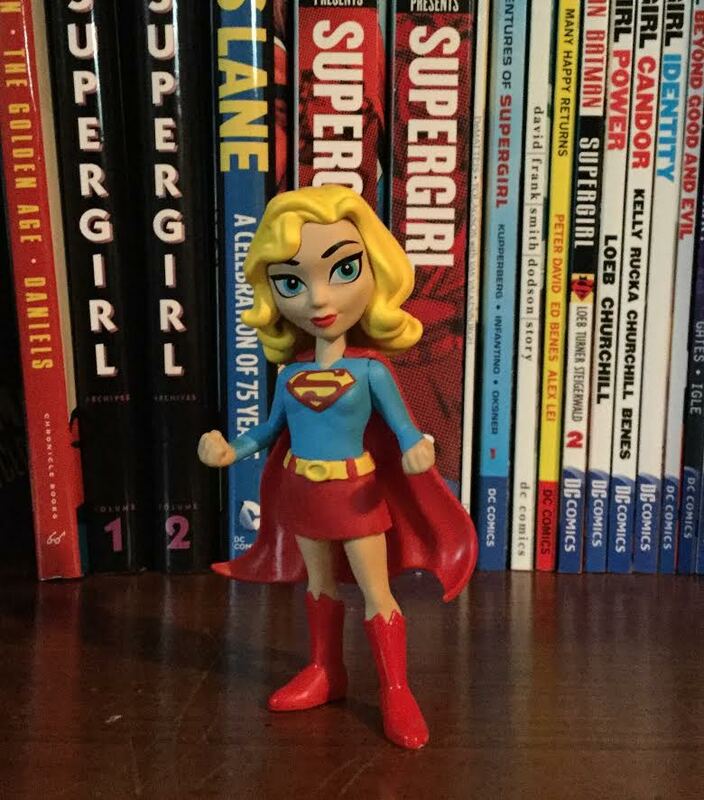 For those who recall, finding a Supergirl Rock Candy figurine was a mission of mine for the Boston Comic Con. Luckily, I can say 'mission accomplished'. While I didn't get any actual comics at the con, I did get commissions and this addition to my collection. I knew I was going to love this figure. It is cute. I love the big eyes and powerful stance. I love the Matrix style costume with the red skirt and boots. And I like the sort of 40's movie star hair style. This is just a big win! I am so happy I was able to find it. And it was affordable too! The back is nice as well. There are enough contours and waves within the hair to make it interesting. And the few ripples in the cape is fine. I always want to make sure that the designers don't forget the back of these things. So small flourishes like these are appreciated. Apologies for the relatively lousy picture of this portion of the collection. I promise, a complete look at what the collection looks like now is in the works. Still, the Rock Candy figurine gets put in the 'red skirt' section of the shrine. And it is too cute to put in the 'second row'. I have to rearrange these things so everyone can be seen. Bottom line, I was lucky to find this on the last day of the con. DC Comics' solicits for November came out last week and continued to build on the general optimism that Rebirth has garnered. While I have some questions about where things are going, at least books seem to be going somewhere. By month three of the New 52, I was already questioning the overall grim tone. Here, things feel different. I have my usual quibbles. So read on! 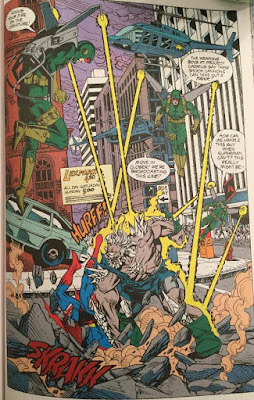 “REIGN OF THE CYBORG SUPERMEN” part three! At last, Supergirl returns to Argo City! But when Kara Zor-El arrives back to her childhood home, a grim discovery awaits, courtesy of the Cyborg Superman! Supergirl must battle for the fate of not one but two worlds as yet another face from her past returns to stop her! So a couple of things here. One, I don't know if I will every get used to the sort of warped style of Brian Ching. Limbs seem thin and stretched. Everything is angular. I don't mind stylized art. I just think I will have to become accustomed to this look. Next, it looks like Cyborg Superman has quasi-resurrected the dead on Argo City. In Supergirl Rebirth we learned from Lar-On that the soil of Argo had turned to Red Kryptonite. So who knows if in the spirit of Rebirth that continuity will be forgotten. Or if the city didn't disintegrate in a blue sun. 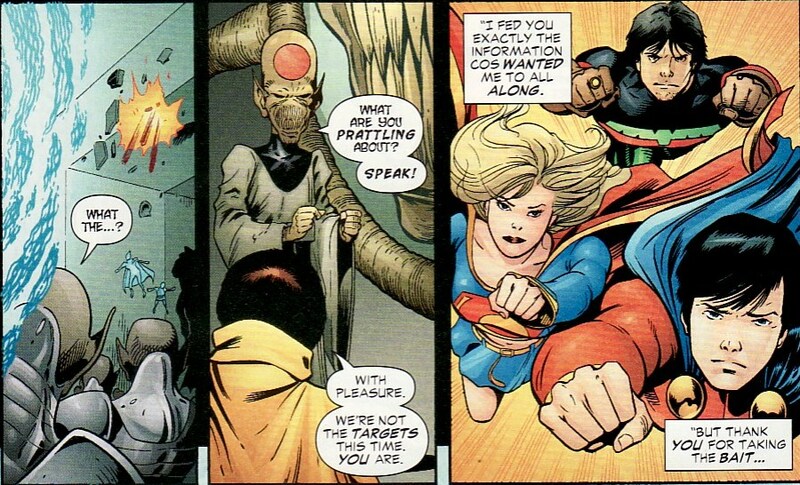 Or why Kara didn't get whammied by Red K back then. I suppose it is a sort of new world. We'll have to see how it all plays out. Every so often I am floored by the attention and adoration being heaped on Supergirl these days. As someone who suffered decades as a fan of the Maid of Might, I am surprised and thrilled to see that she is seemingly everywhere. What is even more insane is that we aren't only seeing a TV-like Kara. 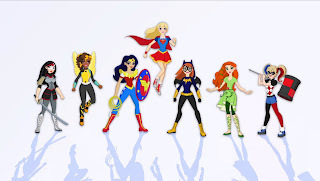 There is merchandise and comics and now video games of all sorts of incarnations of Kara. One I was not expecting to see again was her Red Lantern form. Now I don't play video games so I won't be able to interact with this personally. But the screen shots and scenes look like a ton of fun. 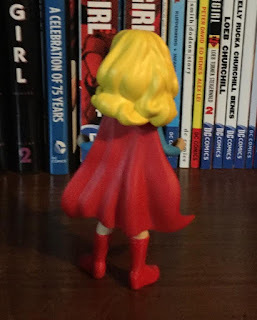 And the Red Lantern Supergirl seems to stand in stark contrast to the 'Cheerleader Supergirl' character who was just in the Cosmic Clash Lego movie. 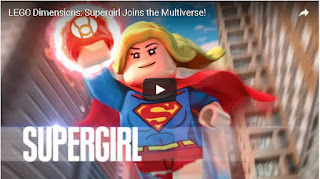 So even within Lego there seems to be versions of Supergirl! 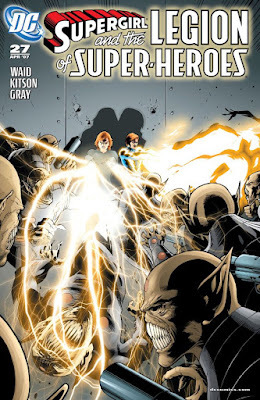 I continue my review of Supergirl and the Legion of Super-Heroes series by Mark Waid and Barry Kitson over on the Legion of Super-Bloggers site. This week I cover Supergirl and the Legion #28. Here is the link. This issue ramps up the Dominator war very nicely. It always seems darkest before the dawn. The bulk of this issue shows just how terrible things are for Earth, the Legion, and the Wanderers. The team is in dire straits. 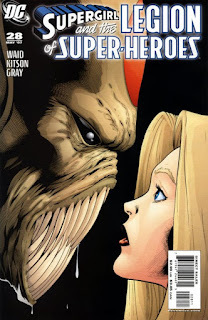 And the cover shows that nicely with Supergirl looking somewhat fearfully at the drooling face of a Dominator soldier. Kara has been pretty unstoppable in this book. So this cover shows the level of the threat. 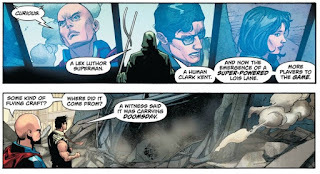 As I said, the bulk of the issue is showing how the Legion seems completely outmatched against the Dominator threat. 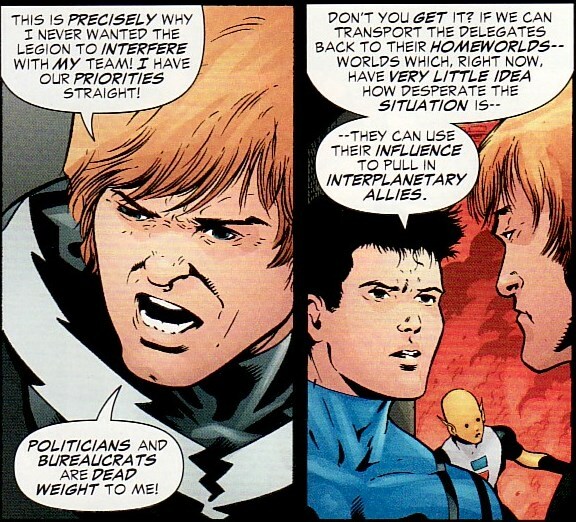 But it ends on a nice high note with the Legion's secret plans to turn the tables coming to fruition. Waid knows how to end a book on a positive cliffhanger. Action Comics #962 came out this week and brought the Doomsday storyline to a sort of close. It isn't really a finale and more like a pause. And I am okay with that. This is the beginning of the Rebirth era. This is the first arc of many that will build up the Mr. Oz character and plan. 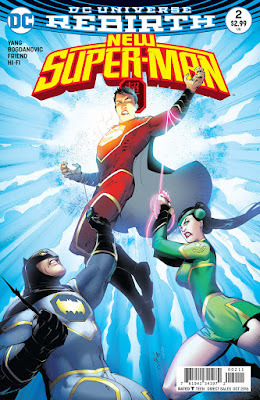 And we as readers are still getting acclimated to this Superman being part of this DCU. Bringing Doomsday into the opening arc was something of a risk. If you start out there, where do you go? And certainly writer Dan Jurgens has played up the threat of Doomsday nicely. The heroes have barely been able to contain him here. So I was worried that the ending might be too pat. As we'll see there is a sort of deus ex machina ... or at least a machina ... which helps speed things along. But Doomsday is a plot device, not a character. The real enemy here is Oz. And we still don't know much about him. I know we are only a month into Rebirth but I keep hoping for some more clues. Throw me a bone! Stephen Segovia is on art here and does a good job with the proceedings. He seems to be a nice halfway point between Pat Zircher and Tyler Kirkham. He is almost perfect in that manner in that he bridges the other issues in a way that will make this artistically fluid when this arc is read in one sitting. Hello and welcome back to another installation of my Boston Comic Con 2016 review. I really consider myself lucky to have been able to grab a commission by Tana Ford at this year's con. And I am not surprised that it is this fantastic. 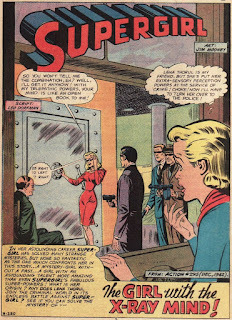 I have always been enamored of Ford's style and this picture of Supergirl is resplendent. From the 'ready for action' pose, to the 'bring it on' expression, to the flying amidst the clouds, this whole thing is mesmerizing. The full color palate really adds so much depth to the piece as well. I am really just floored by this piece. This truly is one of those times where a little bit of leg work on my part pre-con paid off. (I talked about commission planning here.) I had tweeted out to Ford before the con which put me in touch with her handler Geoff Mart. It let me know how Ford takes her list and her prices. Armed with such knowledge, I made sure to head to her table early on in the con. Thankfully, it all worked out. I'm just thrilled with the piece. Ford was super nice and great to chat with as well. 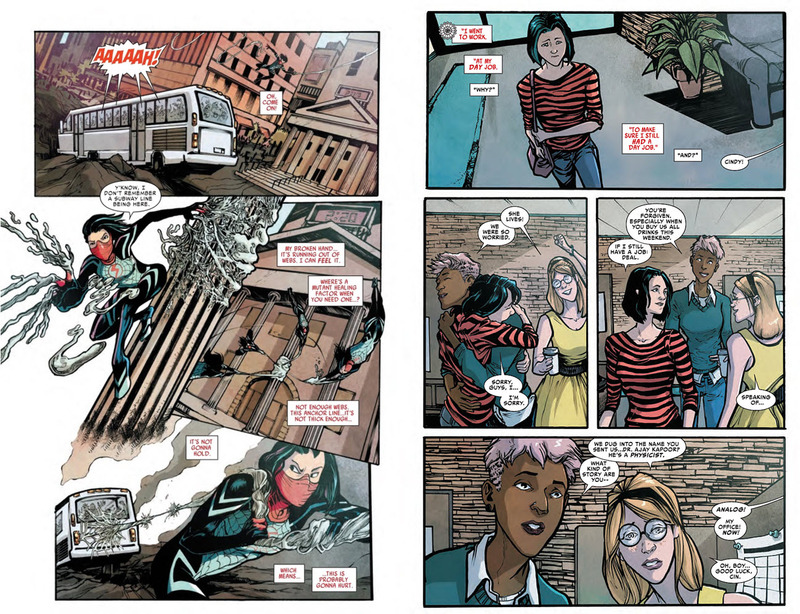 I love the Silk comic as it reminds me of the earliest Spider-Man stories. Cindy is really trying to balance all the aspects of her life while dealing with the utter isolation she suffered early in on. What I love about her art in the book is that Ford is able to shine in all the areas of the plot. So I love the action sequences. There is something fascinating about Silk's webs. She has a sort of 'gangly' feel like Ditko Spider-Man. And you feel Cindy's determination in the fighting. But there is also a softness in the quiet personal moments we see in the book. Ford's expressive work on the characters lends so much to the mood of the scene. I just love it. Again, thanks to Tana Ford for the commission. It is a great addition to my collection. A lot of people have been telling me good things about the Legends of Tomorrow mega-book that DC publishes. While I have some minor interest in a couple of the stars and creators, none of them had enough of a draw to rope me into the hefty $7.99 price point. So I figured I would wait and see if miraculously they ended up in the cheap bins. However, when Legends of Tomorrow #6 came out last week, my social media feed lit up a bit. The Sugar and Spike story guest starred both Supergirl (in her Silver Age incarnation) and the Legion (in multiple incarnations). 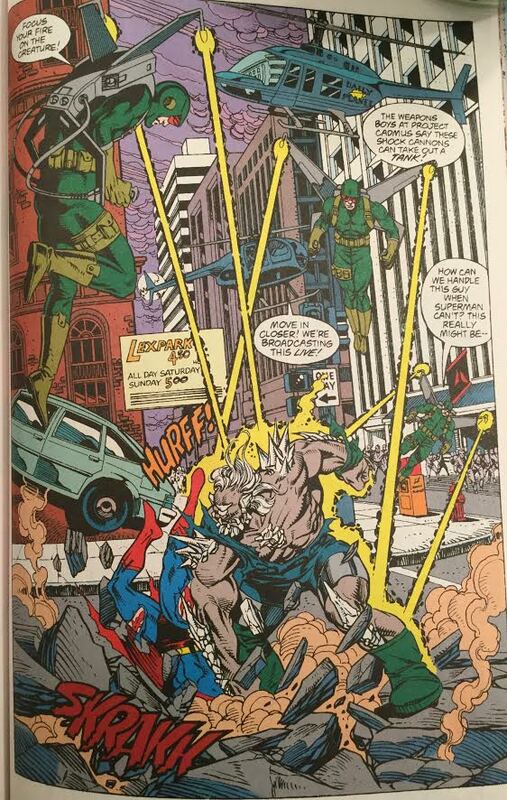 The sample panels by writer Keith Giffen and artist Bilquis Evely really seemed to hit the sweet spot of fun and nostalgia and so I couldn't resist. 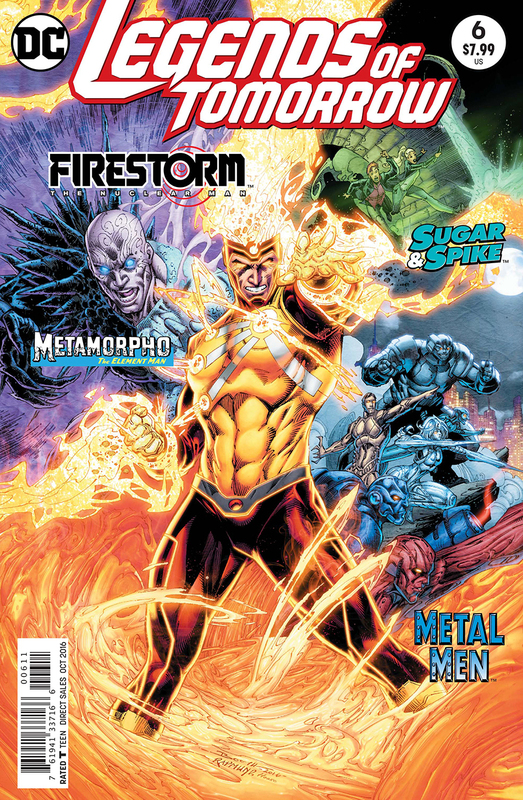 I'll only review the Sugar and Spike tale given the focus of this blog but on reading the other entries, I have to say Firestorm and Metal Men (with a classic Tinny save at the end) read well and might be enough to entice me to grab them all should the books go on sale. But the Sugar and Spike story is near perfection for me. As an old reader who has been through multiple versions of my favorite characters, it was great to see a writer have some fun with all the continuity bugaboos that now exist. I shouldn't be surprised that Giffen wrote this. For one, he has been a creator on any number of Legion incarnations. But also, his (and JM Dematteis') JLA 3001 as well as his Doom Patrol book showed that Giffen can both acknowledge that all the incarnations are viable (even when that simply cannot be so) so long as the reader sits back and enjoys the great stories. His Silver Age Supergirl in JLA 3001 was a high point for me and her character in this story echoes that no-nonsense, oddly mature Kara we saw there. Bilquis Evely is also a huge star in this book. 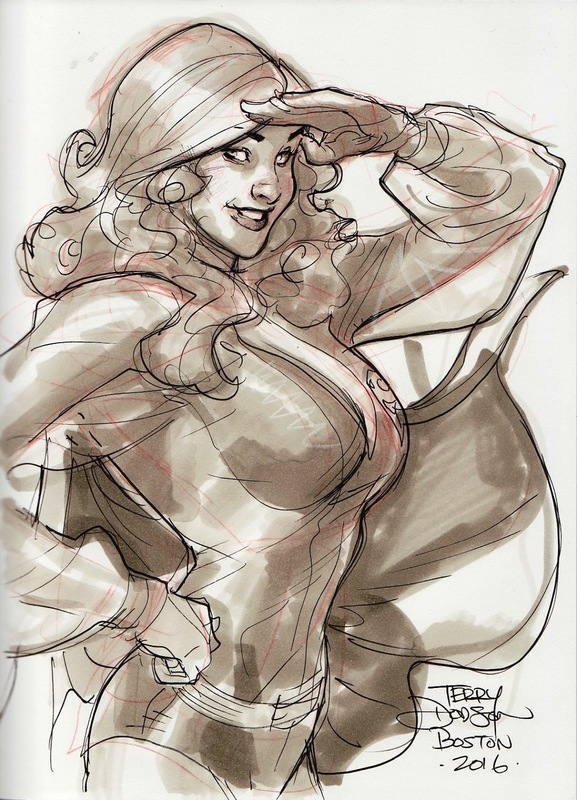 I loved Evely's work on DC Bombshells. But here she shows that she can handle all the ephemera and minutiae that Giffen can throw at her. Supergirl is stunning. But the Legion ... well they are the icing on the cake here. On to the excellent story. In some ways, it is a great time to be a comic fan as there seems to be an explosion of creativity these days. And, in particular, as a DC fan, things are pretty optimistic. DC Rebirth has been a wonderful re-imagining of the DC universe. The tone and plots of the books that I have been reading have all been entertaining and creative. Sales bear out this swell of good will to DC. They had 8 of the top 10 books. All sold over 100K. Buzz has, for the most part, been possible. But I have to look back. Sales may have looked like this in the first month of the New 52. One thing I can tell you, without a doubt, these early books read better than the earliest New 52. I am pretty happy. On to a look at some specific books. 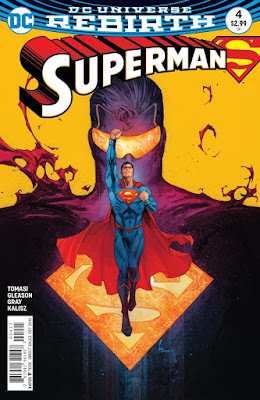 Superman #5 came out last week, the latest chapter in the Eradicator storyline which straddles science fiction and metaphysical plot elements. The new Eradicator is a warehouse not only for Kryptonian culture but also Kryptonian life forces (or souls). And that element is troubling me as a reader. I can't think of many super-hero stories which are able to easily meld religion and science fiction. (Alan Moore's Swamp Thing and Peter David's Supergirl come to mind as good examples.) A story has to be pretty stellar for it to work for me and so I am mulling over this new Eradicator in my mind. Does his new function work for me? If I am able to move past that plot point, story tellers Peter Tomasi and Patrick Gleason continue to give us a wonderful Superman family. Clark is trying his best to protect the world and his wife and son. Jon is being asked to grow up pretty quickly in terms of using his powers and being a hero. And Lois continues to show why she is one of the strongest characters in the DCU. My one quibble is that, like Action Comics, this issue is almost completely a brawl with just a smidge of plot progression. I don't mind action ... but I want more. 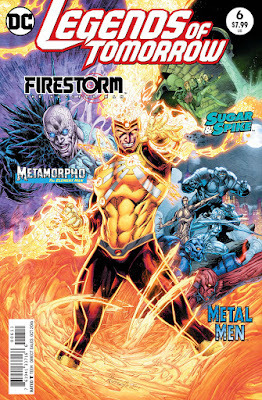 The art on the issue is done by Doug Mahnke. 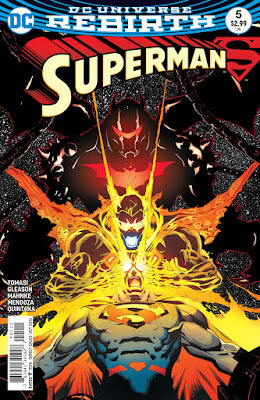 I love Mahnke's style and he brings a sort of otherworldly feel to the Eradicator and the souls within. There does seem to be some softening of his work in places which jibes better with the Gleason style in earlier issues. Supergirl Rebirth #1 came out this week, the first solo Supergirl comic in over a year. It also has been one of the books I have been highly anticipating. Since the first Rebirth press conference, writer Steve Orlando has been saying all the right things about the character. He wants her to be optimistic and compassionate. He wants her to be young and bright. He wants her to be finding her way in the world. He wants her to be a hero. He wants to lean on her history, bringing everything that has been great with the character. It has all sounded perfect. And this issue is a fantastic first issue for this new series. Orlando sets the stage nicely. We get a sense of where Supergirl is in her life. We meet the supporting cast. We definitely see who Kara is both in her actions and her words. And it is refreshingly on point. But we also get some homages to the past. We get some deep DCU cuts. We get a healthy dollop of the show's surroundings. Despite the mentions of some past events in her life, this honestly felt like a soft reboot rather than a tonal rebirth. 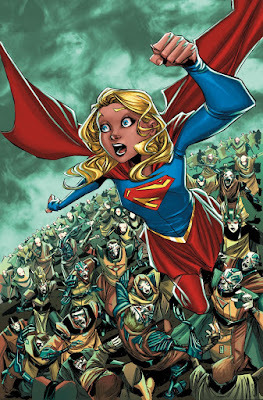 The thing it reminded me most of was the last sort of soft reboot, Sterling Gates and Jamal Igle's Supergirl #34. Trust me, that comparison is high praise. 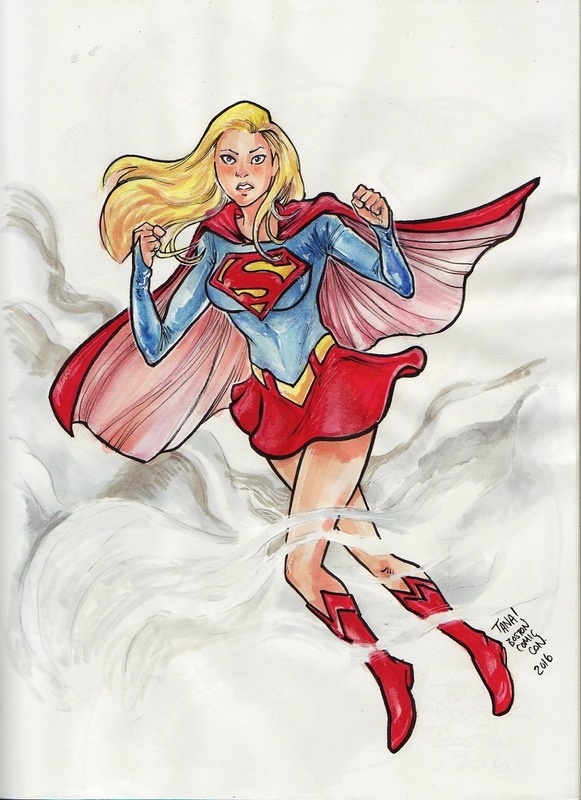 The art in the book is by Supergirl veteran Emanuela Lupacchino. Lupacchino brings a beautiful look to the entire book. The action is well paced. The villain is monstrous. Kara looks healthy and strong. Lupacchino never lets me down. Welcome to the first of multiple posts covering my time at this last weekend's Boston Comic Con. This is *my* show, a huge con right up the road that have attended since its inception. This show has gone from being held in an insurance building basement to selling out the Seaport Convention Center. I consider myself lucky that such a great show is in my back yard. I went to the con with hopes of getting commissions from Terry Dodson, Jae Lee, Tana Ford, and Daniel Govar. I was lucky enough to grab them all. I have been a fan of Terry Dodson for a long time. He is a really nice personable creator who was fun to meet. He takes a long list of potential commissions on the first day and by the end of Friday he had narrowed down the selections to which commissions he thought he could get to. I decided that the 70s costume would be fun and interesting for Dodson to draw and so asked for that Kara. Luckily, I won the lottery and Sunday morning I picked up the above piece ... just stunning! This is pure Dodson. But I love how with just copic markers he makes the sleeves seem translucent. And the salute is a nice patriotic touch. I am just thrilled with this piece. I'll be posting the other commissions over the next three weeks on Thursday. But the rest of this post covers the rest of the con. I was pretty impressed with writer Gene Luen Yang's first issue which walked the tightrope of having a bully protagonist with a tragic backstory acting as hero. While overall Kenan Kong seems like a jerk, that first issue showed he had some hero inside him. New Superman #2 continues to introduce us to the character and his supporting cast while deepening the environment and background plots. Again Kenan is an immature, self-centered kid blessed with powers and maybe becoming a hero. And for now, that hook seems interesting enough to keep me around a little longer. Viktor Bogdanovic is on art and brings a breezy, scratchy style which seems suited for this book which is a mix of political pot boiler and silly teen superhero hijinks. Music! Mon-El! Miss Martian!! Kevin Smith!! Okay, I have been busy these last few days, specifically running around at the Boston Comic Con on the weekend. So, of course, a ton of new information would be dropped about the upcoming second season of Supergirl. The switch to the CW was initially somewhat concerning to me because there was a lot of 'gloom and doom' talk about budgets and episode length and cutbacks. All of this news makes me think that was a lot of worry for nothing. There is a almost too much news that sounds like the CW is embracing the show and giving it everything it needs. I understand this news is kind of stale by the time I am covering it so I won't go crazy, other than to give my thoughts and optimism. And I'll include some links but there is plenty of coverage everywhere. Now as a Legion fan, I actually like the idea of Mon-El being in the pod. Mon-El was rocketed from Krypton. He did meet a super-family member. So him appearing on a Supergirl show is a nice new wrinkle to his comic origins. Comic fans know he needs to be placed in the Phantom Zone to save him from lead poisoning. It is only in the future, with the Legion, that he can be cured. I can imagine some episode on Supergirl ending with him awakening around a Legion team. Unbelievable. As for Miss Martian, I have always liked the character. She had a sort of bubbly innocence at times which was more evocative of classic Supergirl or Mary Marvel in the darker comic medium of the time. I do wonder if she will be revealed to be a white Martian. I wonder if she'll be embraced or pushed away by Hank. There are a lot of story possibilities here. So I am thrilled. 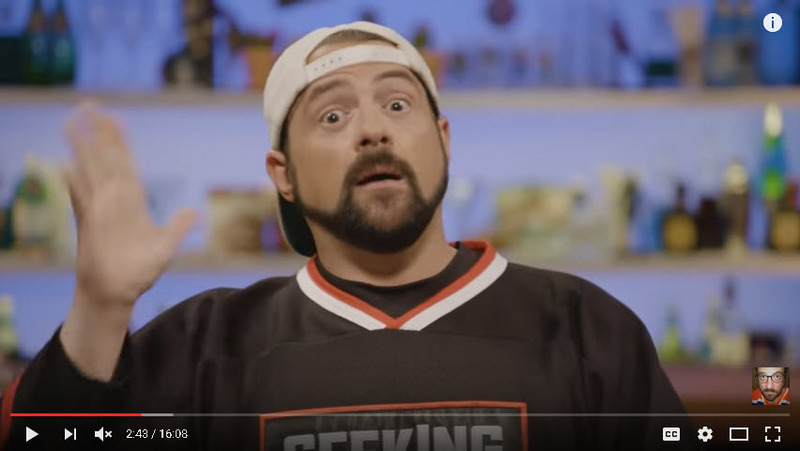 Now I will admit that I am a fan of Kevin Smith. His movies are sort of juvenile fun. His pop cultural references are definitely my pop culture references. And I definitely loved his episode of the Flash. That episode was a gut punch of feelings. So I think that he is going to do something special here. There is no denying his love for the show or his passion for the job. This doesn't sound as if this is part of the big four show crossover but maybe a side adventure? 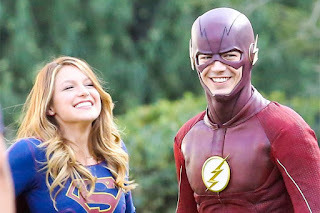 With Grant Gustin and Melissa Benoist both being on Glee, a musical episode has been bandied about since the Supergirl show was announced. And after seeing the chemistry the two had in their crossover Supergirl episode, you knew this was going to happen. I am thrilled to see this. It is going to be such goofy fun. I anticipate a smile frozen on my face. Of course, Whedon made his bones on the Buffy, the Vampire Slayer show (a show I loved). And one of the things he did was a musical episode 'Once More With Feeling'. He would certainly how to direct his way around that sort of episode. But really? Joss Whedon? Now that his star is so bright in the sky, would he do it? Can you imagine the publicity for the show if he did? Anyways, that is a lot of information, all of it which makes me have a ton of optimism for the upcoming season. Incredible! 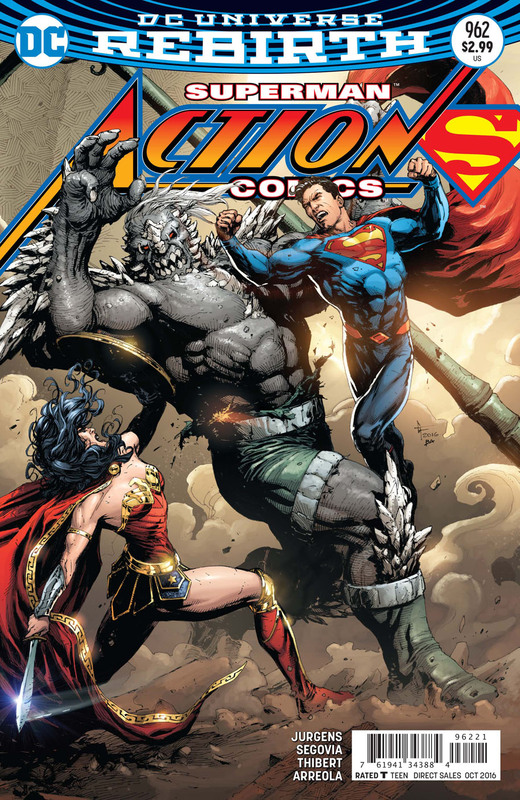 Action Comics #961 came out this week and continued the Doomsday storyline. Once more the issue is packed with a huge brawl as the villain and heroes demolish the countryside. It is big and loud and somewhat glorious in its action sequences, reminiscent of the original Doomsday where page after page was bonecrushing punches and devastating attacks. But there is only so much action I can read before punches become repetitive and kicks become tedious. I need story behind the action and luckily, mercifully, we see some progress with some of the plots that have been simmering since Doomsday first tromped onto the scene. 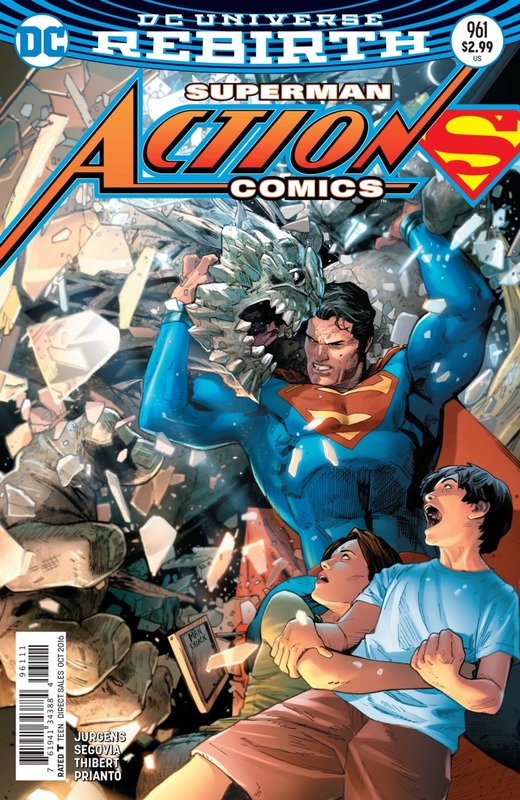 Writer Dan Jurgens has been making Action Comics live up to its name. But frankly, I think Doomsday is a bit overused. And there needs to be something behind the monster for me to get completely engaged. I am hoping the end is near. Stephen Segovia and Art Thibert step in on art for the issue. Their style is more on the Kirkham spectrum than the Patch Zircher side of things. In fact, in places it felt almost like Leinil Yu. But the biggest thing for me about the issue was the ending, as it marked some progress in this 12 round fight. 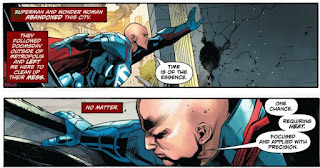 One thing I have been trying to deal with is the 'Lex as Superman' arc. Perhaps the best thing is that Jurgens continues to show us glimpses into Alex's soul. He isn't a hero. He definitely seems to be selfish, occasionally deluded. Nothing said that more this issue than these panels. 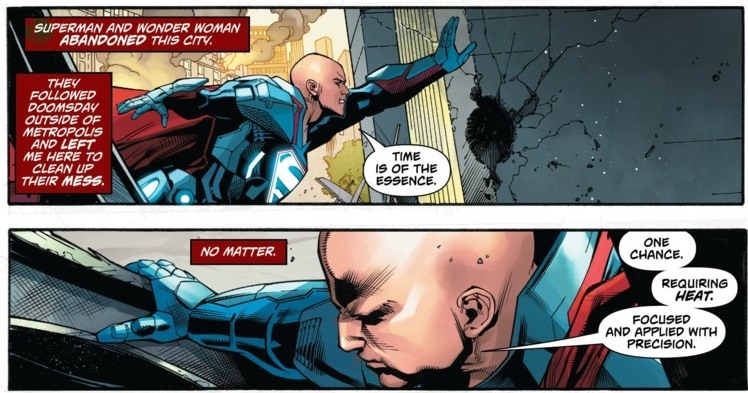 Instead of being happy that Superman and Wonder Woman took the fight away from Metropolis, Lex instead thinks this love means they abandoned the city. That's crazy. And a little self centered. It shows just who Lex is. Now initially I thought that Mr. Oz was the villain behind everything that is happening. But more and more it seems like he is merely observing. He isn't moving these game pieces; he is merely noting them. Makes me wonder about who he is. Maybe I have another theory. And then we get a classic comic book trope. Lex examines the craft Doomsday fell from and notes that, despite having worked with every metal on Earth, that this one is different. So where did Doomsday come from. But then we get a lot of battle on the outskirts of town. Doomsday pounding Diana. 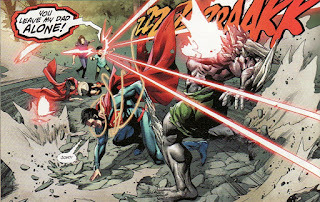 Doomsday pounding Superman. Superman pounding Doomsday. It is a lot of back and forth. Wonderfully rendered. But just a brawl. It is only when Superman is truly in danger that we see something new. Jon lashes out with his heat vision and does some damage. It reminded me of Jon's big moment in the Superman book. 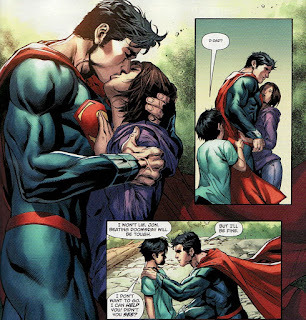 Temporarily free, the Man of Steel says goodbye to his wife and family. Their safety is his primary goal. I have liked these tender moments again showing why Lois and Clark work so well as. Couple. Superman convinces Diana to take his family off world to the JLA satellite while he tussles with Doomsday more. Interestingly enough, Mr. Oz decides that the time is right for him to get involved. Doomsday needs to be taken off the board. Suddenly a henchman arrives and Oz gives some orders. So this was both progress and a bit of a letdown. The mysterious Mr. Oz seemed like a zen-master, almost mystical. It seemed like he was operating from limbo. He was so enigmatic he seemed like something bigger than the usual villain. Now I know these are my perceptions. But the way he talked, and how he acted, he seemed like someone outside of or bigger than reality. But then he goes and has a henchman. Something rather tawdry, ordinary. He goes from being a philosophical force to being akin to the head of Intergang. The appearance of this flunky somehow minimized Oz. But then the henchmen squad go out and save Superman! 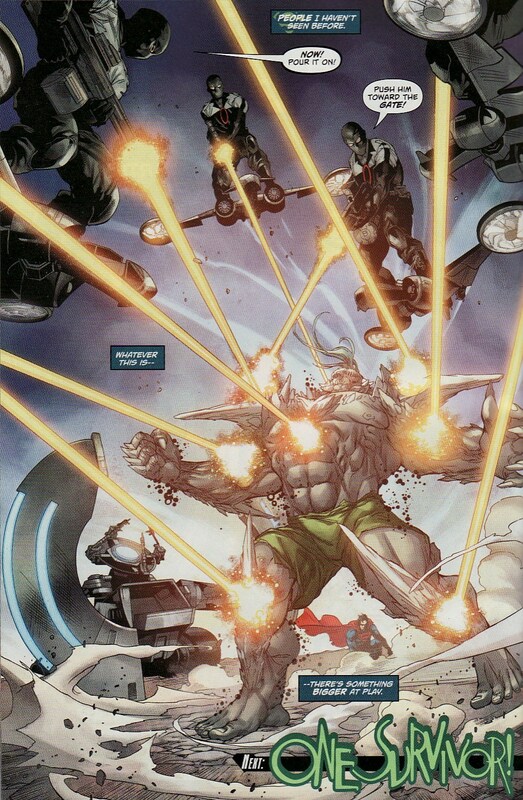 Using force beams, they corral Doomsday. Hmmm... this kind of looks familiar. That can't be by accident. It certainly looks like Jurgens is riffing the original story. And so now I need to rethink my guess about Mr. Oz. you may recall I recently thoug he might be Jon Osterman. But now, having henchmen, talking like he did, I'm wondering if he is something more mundane. Maybe he's another survivor of the pre-Flashpoint universe? Someone from Cadmus? Hopefully not that version of Luthor. That'd be too trite. I'll continue to hope it's Osterman. And at least the appearance of these flying men trying to capture Doomsday is a new wrinkle to the plot, moving things along. Maybe this Mr. Oz thing will wrap,up sooner than I expected. I have been reading comics for a very long time. I thought I had seen every twist and turn. I thought I could anticipate where a story was going. It has been almost 2 score years since I started this hobby. I have seen it all. So when I comic actually surprises me, when I am gobsmacked by a plot twist or cliffhanger, it is akin to gold. 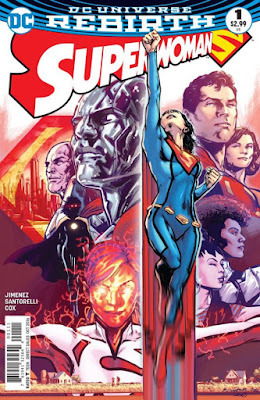 Phil Jimenez's Superwoman #1 came out yesterday and it surprised me twice. Maybe in retrospect I should have only been surprised once. But nope, twice. That alone made this a great opening issue to a book I had been looking forward to. But when I add to that the layers upon layers of characterization that Jimenez puts in this first issue and I have a winner. But Jimenez also did a fine job of mixing old classic tropes with this new universe, the very purpose of Rebirth. And when I take a step back and realize that this is a heavy read, almost two issues for the price of one when you think of what happens, a compressed story in a world of 2 minute reads, I was even happier. This is the first chapter of an ongoing serial. There is a lot to digest. There is a lot to mull over. But from an entertainment point of view, I was thrilled. And entertained. And surprised. And impressed. And frankly, the older I get the harder it is to do all of those things. I have seen exceedingly little of McGrath's work although plenty of people tell me her work on BCC's Merlin was exemplary. So I am looking forward to see what she brings to the table. 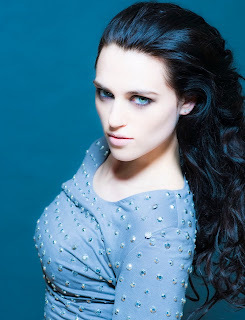 The character of Lena is no stranger to Supergirl or the DCUniverse. She was a recurring character in Supergirl's Silver Age adventures, she popped up in Superman Family, she was an antagonist in Cosmic Adventures, in a vegetative state in the pre-Flashpoint world, and has been in opposition of her brother in more recent times. 'The Girl with the X-Ray Mind' was originally printed in Action Comics #295 back in late 1962. 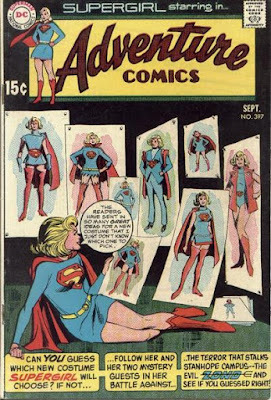 For the sake of transparency, I need to let you know that my scans are from the Super DC Giant Supergirl issue from 1971. I don't own Action Comics #295 (yet). The story is a brief 13 pages but, like many Silver Age stories, it is jam packed with story. This is no decompressed tale. Creators Leo Dorfman and Jim Mooney spin a yarn which introduces us to Lena and her power set, talks of Lena's early years, sneaks in a Luthor guest spot and reviews his origin, has Lena become a criminal, and wraps it all up in a bow. Whew ... they knew how to tell them back then! I love this splash page. Lena is fetching in the red cocktail dress and domino mask, invoking images of the old pulp heroine the Blonde Phantom. 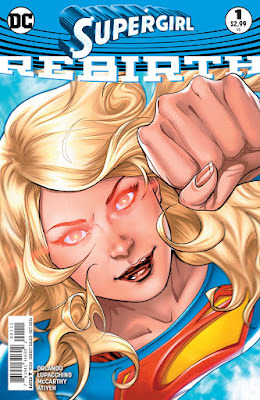 Amazingly, we are one week away from Supergirl Rebirth #1. I have been eagerly awaiting this book as everything writer Steve Orlando has said has sounded perfect. He seems to have an great understanding of Kara. 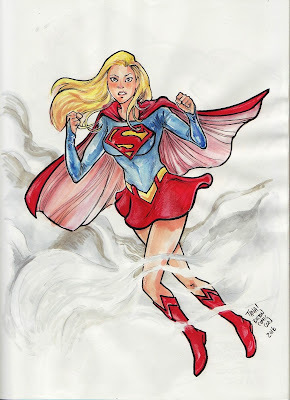 And Emanuela Lupacchino is on art and we know how perfect she is for Supergirl. 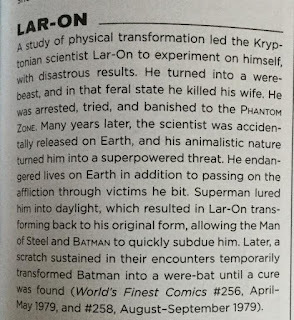 But there was one more piece of his history I thought I would share for completeness sake, his entry in the Superman Encyclopedia. While the facts seem a little loose about the actual encounter, one thing stood out. 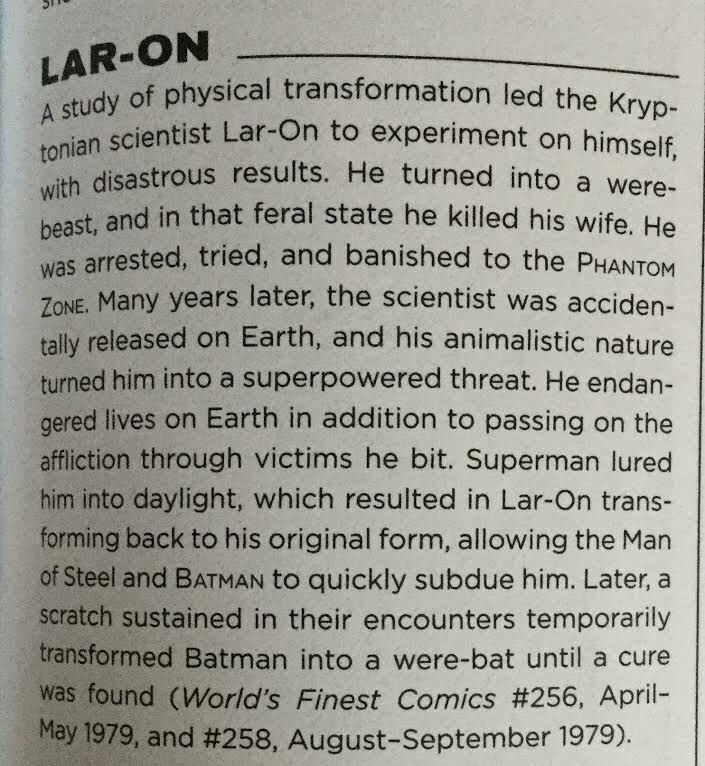 Here it says Lar-On was a scientist fascinated with physical transformation who experimented on himself. That is new information not presented in the stories at all. Suddenly this isn't a curse or a disease, this is a self-inflicted condition. I don't think an encyclopedia should be providing novel information. And I don't know where that information comes from unless there is another Lar-On appearance I'm not aware of. But it makes his feelings of guilt (as seen in the comics) more painful and palpable. 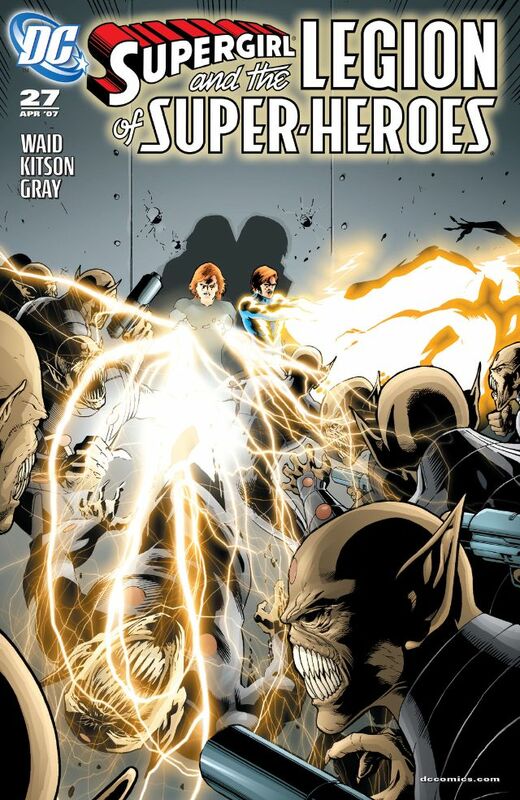 The latest is titled 'Doubles Trouble' and really focuses on Supergirl. DCSHG really has played up Kara as a stranger in a strange land, have her respond adorkably to her new home and 'out in the open' powers. It makes her a very endearing. She remains positive despite her silly gaffes. DC Bombshells #16 came out in print last week and was another great issue in the this run. 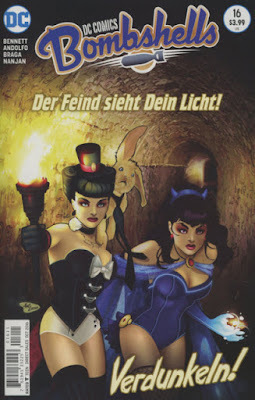 Writer Marguerite Bennett uses the issue to flesh out the back story of several of the Bombshells, giving us an understanding of their motivations and fears. The back half of the issue is focused on Mera and her origin, looking at her exile from Atlantis and her dysfunctional family. As I said, this issue really added some depth to these characters. It is one thing to have an image of Kate Kane smiling and swinging her bat in her Batwoman costume. It is another thing to learn that she has witnessed tragedy and how it has scared her. We have moved a long way from simple pin-ups by Ant Lucia. We have fully formed characters now. As usual, Mirka Andolfo and Laura Braga bring some beautiful and powerful art. Andolfo is artist on Huntress/Batwoman pages in Europe. I love Andolfo's style which can seamlessly veer from the silly (Harley pages) to the serious. And Braga brings some weight and fascinating page layouts to the Mera pages. My one complaint? 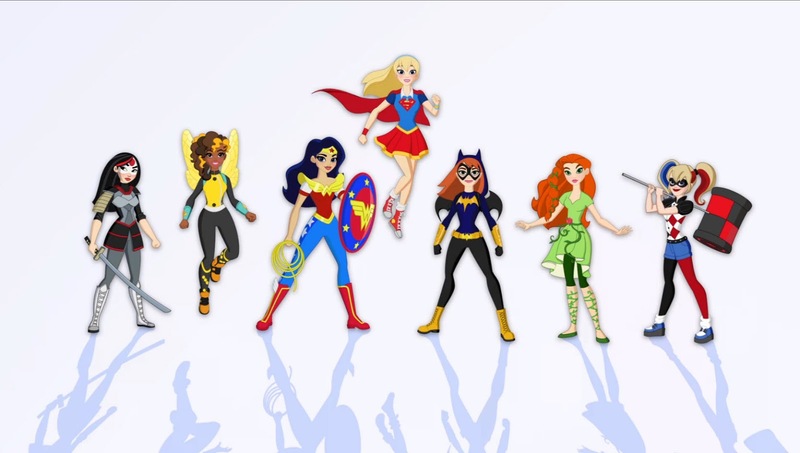 No Supergirl and no Wonder Woman ... again. I'd love a check in with those characters. This will be a quick review. The prior issue had established the Dominator threat. War was happening. And the Legion were at odds with the quasi-allies The Wanderers. This issue ramps up the Dominator threat, showing us just how difficult this war will be to win. From all angles, it seems that the Dominion has the advantage. 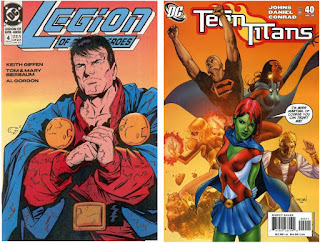 Story tellers Mark Waid and Barry Kitson do a great job of showing just how outmatched the Legion are in these early stages. It can't be war without casualties and we see our heroes gravely injured. And yet, despite all the action, Waid and Kitson continue to infuse wonderful character moments. Most of them come contrasting Mekt's approach to problems with the Legion. Here Mekt simply wants to chalk up the death of UP delegates as casualties of war and the dropping of dead weight. Cos both upholds the sanctity of life and knows that those delegates would be powerful allies against the Dominators. It is a small moment but speaks volumes about who the Legion are. With the pedal floored, this book continues to roll on! 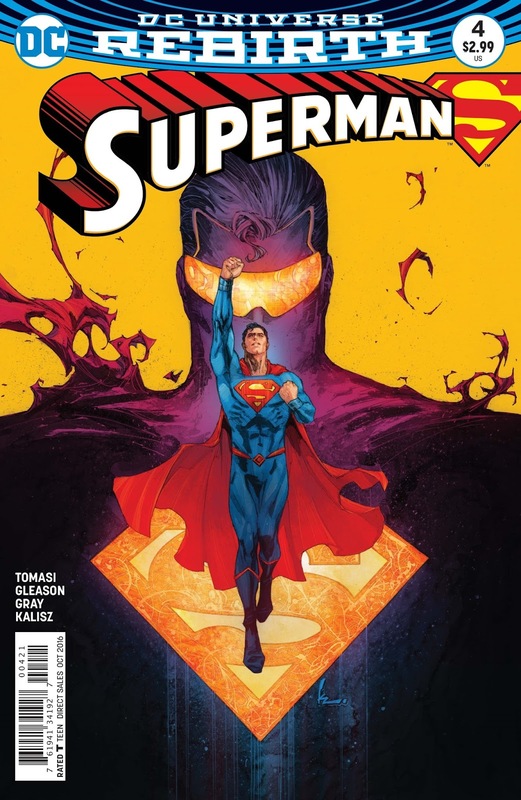 Superman #4 came out this week and continued to be a fast paced, wild ride of an issue. There is barely a change to catch your breath as story-tellers Peter Tomasi and Patrick Gleason give us a horror-tinged tale of death, souls, and ghosts. I will admit that I am not entirely on board with the idea that the Eradicator sucked the 'life force' out of Kryptonians. It seems a bit too nebulous to me. If this was Hellblazer or Madame Xanadu, I might be on board. But I am still mulling over if I like it here. How many souls does the Eradicator hold? All of them? Is the 'soul' of Jor-El and Lara in him? That said, the book has a great feel of terror in it. There are scenes that are evocative of Raiders of the Lost Ark. Some of the pages seem surreal like Dr. Strange. The colors by John Kalisz really dazzle, a wild display of yellows and purples. It feels a little out of place in a Superman book and that is a good thing. It is engaging. Lastly, there are some great personal moments here as well. Jon takes a big step towards being a hero. 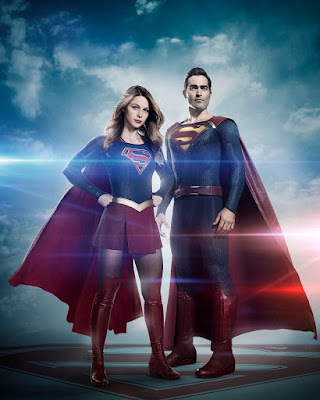 We meet Superman's pal Bibbo and hear how inspired he is by the big red S.
I have been covering a lot of Supergirl show news here on the site but The CW keeps giving it to us! Much like last year before the first season, it seems that the show runners are continuing to feed the fire, getting the fans stoked. Whether it be leaked Superman pics or rumors that Mon-El is in the pod, there has been a ton of things to comment on. 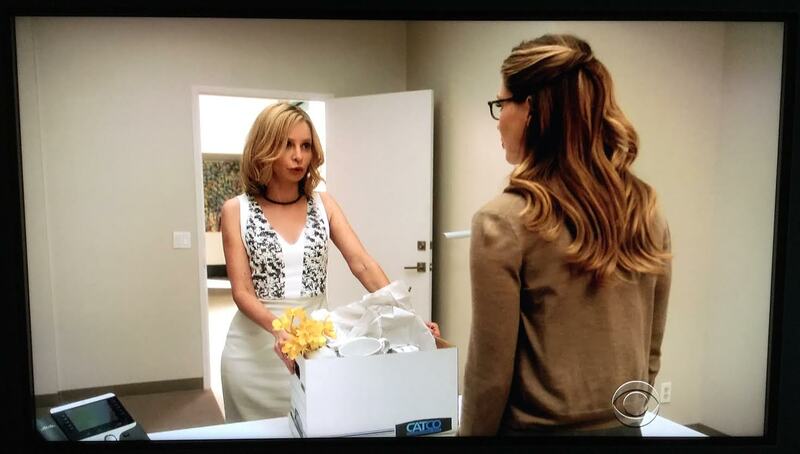 But one thing that was hanging over the show was the fate of Calista Flockhart and Cat Grant. 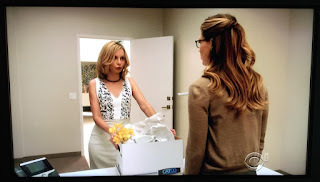 The creation of a 'new job' for Kara in the first season finale as well as the creation of Snapper Carr's role as a journalistic boss, it seemed like things were set up to simply have Cat be gone. 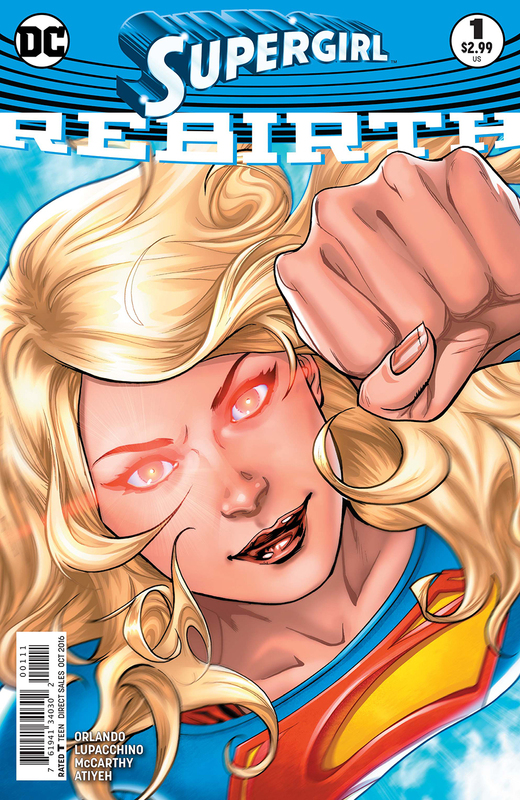 We are just a couple of weeks from Supergirl Rebirth #1, the reintroduction of a Supergirl book into the new DCU as well as the reappearance of Lar-On the Kryptonian werewolf! I am really looking forward to what writer Steve Orlando and artist Emanuela Lupacchino will be delivering. The brief glimpses of the book we saw at San Diego Comic Con looked incredible. 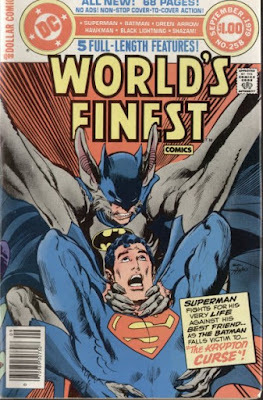 I have been taking a look back at Lar-On's brief history in the DCU starting with his first appearance in World's Finest #256. While that was Lar-On's only true appearance, his story sort of continued in World's Finest #258. As this story included an interesting wrinkle about Lar-On's lycanthropy, I thought it was worth sharing here. I am hoping that Orlando explores that bit of 'The Krypton Curse' but we'll see. Lastly, I remember having this comic as a kid. I must have bought it right off the rack. Unfortunately all sorts of books from that time simply disappeared, meaning I was on a hunt for this one in all the comic stores I came across. Hard to believe that I found it while on vacation earlier this summer. Upcoming Collections! I'm Going To Be Broke! The link sent me to Amazon to look for myself. 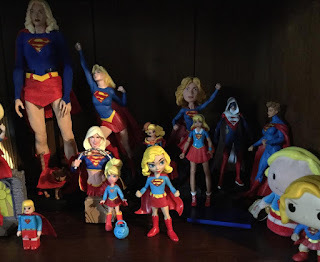 I am continually amazed at how popular Supergirl has become. Just looking at trades, within this year, we have seen a slick Silver Age Omnibus, the resoliciting of the Sterling Gates/Jamal Igle trades, a Daring New Adventures trade, reprintings of the first Peter David Supergirl volume, reprints of the Loeb/Turner stuff, and the resoliciting of the Landry Walker/Eric Jones magnificent series Supergirl: Cosmic Adventures in the Eighth Grade. Whew! 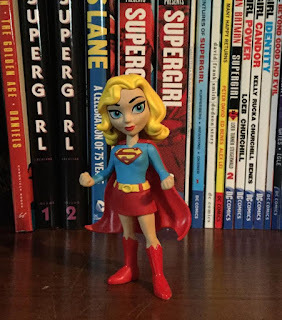 That's a lot of Supergirl collections on the shelves. Now we have even more trades coming out. 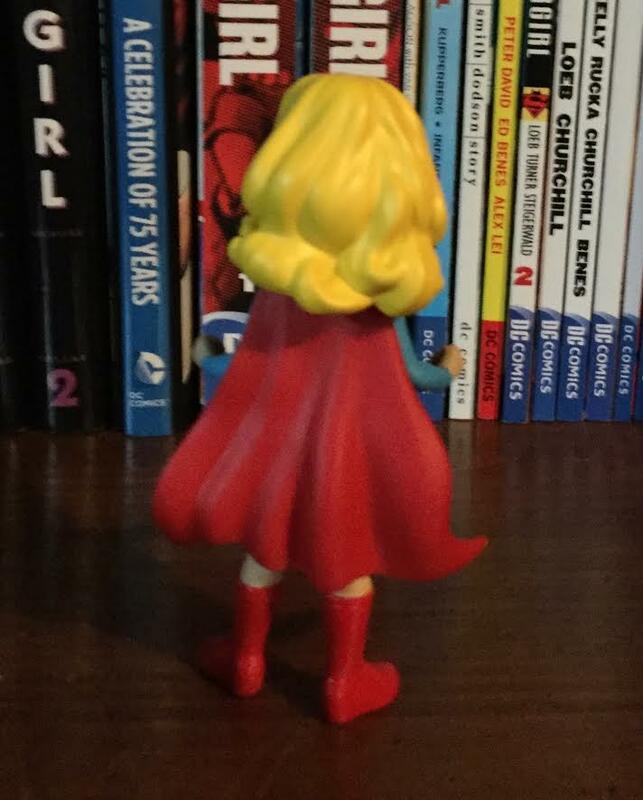 A Supergirl Bronze Age Vol.1 is coming out! And another volume of the Peter David Matrix run as well. Suffice it to say, DC realizes (finally) that Supergirl is a marketable character with a deep history. I'll take a closer look at the trades below. And then a ton of photos of Hoechlin filming in Vancouver in the suit hit the internet. Now I am going to preface this post by saying that I didn't like the first look of the Flash costume when they revealed that and I think it looks good on the show. And I didn't like the first look of Melissa Benoist's costume (remember when it looked like super dark blue/almost black and brick red cape and boots). But that also looks fine on the show. To be honest I don't have many complaints about the costume although I will nit pick a bit. Instead, my biggest complaint in with Hoechlin. Not that he doesn't look like he could play Superman. Just that he is way way too young. These two look like they are contemporaries. He is supposed to be around 12 years older than her. This just doesn't jibe with the timeline. I have to hope that somehow we get an explanation, even if it is comic book-y in its science.